Trainer Tony Gollan is predicting that Most Important will be able to overcome a wide barrier and be amongst the prizemoney in the $1m Magic Millions Cup (1400m) at the Gold Coast on Saturday. Most Important, above with white sleeves, has to overcome a wide barrier in the 2018 Magic Millions Cup at the Gold Coast. Photo by Daniel Costello. Most Important finished fifth behind Testashadow in last year’s Magic Millions Cup on the end of a hat trick of city wins but Gollan said that five year old is peaking at the right time this year and is giving him a great chance despite an awkward barrier draw. Most Important was given the seventeen marble at the barrier draw but will jump from gate fourteen out of sixteen with three scratched inside of him with Jim Byrne in the saddle. 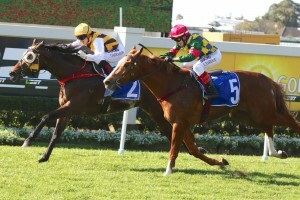 “If he can get across from his wide barrier, which I think he will over 1400m, I think he’ll run a terrific race,” Gollan told racing.com. “He’s a really honest horse and this time last year he’d won three or four on the trot and was flying but I got to Magic Millions day and he was pretty well on empty after a long prep,” he said. Most Important was back in the winner’s stall two starts back in claiming the Listed $150,000 Lough Neagh Stakes (1350m) at Doomben on December 16 and then ran second to Magic Millions Cup favourite Care To Think $150,000 Magic Millions Buffering (1350m) at Doomben on December 30. The Matthew Dunn trained Care To Think has also drawn wide and will jump from the extreme outside barrier for Jeff Lloyd but has still be installed as the $3.50 favourite at Ladbrokes.com.au while Most Important has been marked at the juicy odds of $19 on Friday afternoon. The front running Arbeitsam, from the powerful Gai Waterhouse and Adrian Bott stable, is on the second line of betting at $6 and Tim Clark will be able to easily find the front again from the inside gate. Trainer Liam Birchley will saddle up the $6.50 third favourite Crack Me Up who will jump from gate four with Damian Browne in the saddle. The only other runner under the $10 mark is the Darren Weir trained Lucky Hussler ($9) who was also out of luck at the barrier draw and will jump from gate fifteen with Blake Shinn aboard.